"What is sorrow?" she suddenly asked. "Somewhere in the background I seem to have had it all my life. Though all but one of my children are well off and contented, sorrow has been constantly with me. I can't put my finger on it, but it has pursued me, and I often lie awake at night wondering what it is all about. I am also concerned about my youngest son. You see, he is a failure. Whatever he touches goes to pieces: his marriage, his relationship with his brothers and sisters, and with his friends. He almost never has a job, and when he does get one something happens and he's out. He seems incapable of being helped. I worry about him, but though he adds to my sorrow, I don't think he is the root of it. What is sorrow? I have had anxieties, disappointments and physical pain, but this pervading sorrow is something beyond all that, and I have not been able to find its cause. Could we talk about it?" In my early years of coming into contact with Krishnamurti's words, there was a feeling that he was somehow always with me, travelling with me, observing my actions and my thoughts, so completely relevant, so appropriate, so immediate, the passages in his books appeared to be. He clearly deeply understood the feelings, motives, fears and pain of the ordinary human being. Nowhere was this more apparent than in the “Commentaries on Living” series. “Krishnamurti travelled extensively in Europe, India and America and hundreds of men and women met with him and discussed the innumerable personal problems of their varied lives. 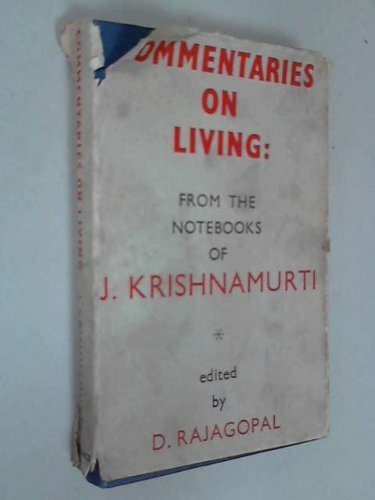 Krishnamurti noted down these recollected conversations and the Commentaries on Living series was compiled from his notebooks. The range of subjects Krishnamurti deals with is wide and his discussions with individuals are the expressions of intensely emotional experiences, not merely philosophical inquiries or the intellectual, speculative search for solutions”. All human problems are within the pages of these books. The man on his death bed begging to know the meaning of death, the bored and frustrated housewife, the sanyasi who spent decades of their lives in fruitless search. Women long suffering in abusive relationships. The revolutionary ready to kill for his cause. And those who had become somewhat aware of the limitations, the conditioning of the mind and the mediocrity of thought, but were confused, uncertain what to do. And throughout the books, one can see the myriad forms of escapes that people become lost in. What is making you dull? Apart from the communion with so many people, Commentaries on Living contains Krishnamurti's penetrating and lyrical descriptions of the world around him, both the world of nature and the world man has created. Travels on smoke filled trains, flights above the peaks of Himalayas, and journeys deep into the human mind. The parrots nesting in the old stone wall, the funeral pyre on the banks of the Ganges, a single tree in an Alpine meadow. Meetings in the wilderness with tigers, bears, rattlesnakes. Ancient temples, beautiful mosques, majestic cathedrals and the ugliness of modern towns all over the world. “IT WAS A small pond, but very beautiful. Grass covered its banks, and a few steps went down to it. There was a small, white temple at one end, and all around it were tall, slender palms. The temple was well built and well cared for; it was spotlessly clean, and at that hour, when the sun was well behind the palm grove, there was no one there, not even the priest, who treated the temple and its contents with great veneration. This small, decorative temple gave to the pond an atmosphere of peace; the place was so still, and even the birds were silent. The slight breeze that stirred the palms was dying down, and a few clouds floated across the sky, radiant with the evening sun. A snake was swimming across the pond, in and out among the lotus leaves. The water was very clear, and there were pink and violet lotuses. Their delicate scent clung close to the water and to the green banks. There was not a thing stirring now, and the enchantment of the place seemed to fill the earth. But the beauty of those flowers! They were very still, and one or two were beginning to close for the night, shutting out the darkness. The snake had crossed the pond, come up the bank, and was passing close by; its eyes were like bright, black beads, and its forked tongue was playing before it like a small flame, making a path for the snake to follow”. Sometimes one gets asked “Which single book would you recommend as an introduction to Krishnamurti?”. I think one of the Commentaries on Living series could well be my selection.